The FAO is convening an ‘International Symposium on Agroecology for Food and Nutrition Security’ from September 18-19 in Rome. Ahead of the forum, more than 70 scientists signed onto an open letter supporting the organization for taking on agroecology, while urging them to strictly defend agroecology as a science, a set of practices, and a social movement for food sovereignty and social justice. Jahi Chappell is Director of Agroecology and Agricultural Policy at IATP, and the letter’s author. I’m reposting his article here, including links to the letter. Nearly 70 scientists and scholars of sustainable agriculture and food systems sent an open letter to the Food and Agriculture Organization of the United Nations (FAO) today, praising the organization for convening an International Symposium on Agroecology for Food and Nutrition Security. Given the multiple, overlapping challenges posed by continued food insecurity, rural poverty, climate change, drought and water scarcity, the letter calls for a solid commitment to agroecology from the international community. According to the letter, agroecology’s broad base in science and society means it is uniquely suited to address today’s challenges in food and agricultural systems. It can be considered a science, a set of practices, and a social movement for food sovereignty and justice. As a science, agroecology integrates multiple disciplines into a “trans-discipline,” drawing on fields such as ecology, agronomy, political economy and sociology. As a set of practices, it can provide multiple benefits to society and the environment, from reducing pollution from agriculture and supporting the conservation of the environment to boosting nutrition security and improving resilience in a changing climate. As a movement, it can address the vitally important issues of distributive and procedural justice in food and agriculture—that is, who gets access to what resources and how to decide. The letter points out that, according to well-established science, social movements and addressing distributive and procedural justice are just as crucial as scientific and technical innovation in sustainably implementing the right to food. International institutions are currently using a variety of different terms, with different meanings, to identify a way forward for agriculture and food systems to address critical crises including climate change and food security. The FAO and other international institutions like the World Bank have supported other approaches which they call “climate-smart” agriculture and “sustainable” intensification. The letter criticizes these as vague terms that are subject to abuse through misleading or incomplete definitions. In contrast, agroecology is a holistic approach with a long history and an extensive body of knowledge grounded in science and in the experiences and leadership of farmers themselves. The scholars call on FAO member states and the international community to build upon the proceedings of this symposium in order to launch a U.N. system-wide initiative on agroecology as the central strategy for addressing climate change and building resilience in the face of water crises. Such an initiative could form one of the pillars the future work of the Committee on World Food Security (CFS) and make an invaluable contribution to negotiations about agriculture within the U.N. Framework Convention on Climate Change process and the post-2015 Sustainable Development agenda. The letter closes with a hope that the FAO will consider this proposal at the forthcoming Committee on World Food Security meeting on October 13–18, 2014. Read the group sign-on letter to the FAO for more. The China Cuisine Association (CCA) is in the midst of their second attempt to get Chinese food listed on UNESCO’s ‘Intangible Cultural Heritage of Humanity’ list. After the first try failed for being too general, they’re looking for specific suggestions. So I wrote this open proposal, urging the CCA to consider Chinese pork for their application, but from a perspective that suggests how agro-biodiversity and food traditions are intimately linked. My proposal includes pigs, pork, and sustainable farming. More precisely: Chinese indigenous pig breeds, the fatty pork and related culinary traditions that come from them, and the sustainable agricultural practices that farmers in China have used for millennia to raise them. This approach would not only acknowledge and protect (agri)cultural heritages that can offer guidance for addressing some of today’s most pressing problems, it would also urge a healthy dose of moderation as part of the project of modernization. In the context of converging food, climate, energy, and environmental crises, these are things we desperately need. See the full proposal below. We find ourselves in a time when the global community must deal with the convergence of food, climate, energy, and environmental crises. Agriculture is at the heart of each of these issues individually, and as they relate to one another. On the one hand, decades of corporate-led industrial agricultural development have polluted water, land, air, and human bodies across the globe. This chemical-and resource- intensive form of production also contributes massive amounts of greenhouse gases to the atmosphere, while it robs soils and communities of nutrients, nutrition, and food and agriculture decision-making capacity. On the other hand, locally-situated small-scale production offers the best hope for reversing these trends and ameliorating the linked crises. Research is increasingly conclusive on this point, even as the political an economic winds continue blow in direction of industrial agriculture. China’s food and agricultural systems contribute to these global problems. However, China can also be an important part of their solution. The country’s agri-culture is based on centuries of accumulated knowledge about low-input, low-pollution, and low-carbon agricultural practices that produced a rich and diverse culinary culture. On this basis, I propose that sustainable farming and sustainable agrifood systems in China need to be preserved and protected for China and for the world. Of particular importance is the sustainable production of pigs and pork, the country’s most culturally significant form of meat. Over the past 30 years, China has increasingly adopted industrial agricultural methods to increase production and to ‘modernize diets.’ As a result, the country is now plagued by a host of agriculture-related environmental and social crises. Chief among these is water pollution from industrial livestock farms, as billions of tonnes of untreated manure flow into the country’s streams, rivers, lakes, and ecosystems each year. Manure from large-scale pork and poultry feeding operations is, in fact, the largest source of water pollution in China today. The pollution increases in tandem with rising rates of meat and poultry consumption, killing aquatic life, disrupting water cycles, and poisoning drinking water. It is important to emphasize that industrial livestock pollution isn’t unique to China. (In August 2014, a toxic algae bloom near Toledo, Ohio, USA left 400,000 people without drinking water. In Ohio, industrial livestock pollution wasn’t the only culprit, but it was certainly an important causal factor.) Similarly, China isn’t alone in the challenges it faces with antibiotic-resistant disease-causing organisms, declining livestock and plant species diversity, agrochemical poisoning of soil and water, and increased greenhouse gas emissions from all phases of industrial livestock production. Nor is it unique in the health and agrarian issues that result, including pollution-related cancers, diet-related diseases, corporate concentration, and struggles for small-scale farmers to compete with growing corporate power. Indeed, these are crises endemic to industrial livestock systems in general, occurring everywhere such systems touch down, and creating and/or exacerbating the grave socio-environmental challenges that are coming to define our moment in human history. It is also important to recognize and emphasize that what is unique to China, and what absolutely needs to be protected and publicized, is the long history of small-scale, intensive agricultural practice that has fed a dense population without degrading local resources or changing climates for centuries. It is well documented that China has perhaps the longest unbroken history of what might be called ‘sustainable agriculture.’ China today, and the world more broadly, has much to learn from this history. But with the march of industrial production across ever broader swathes of the country and the globe, it’s a history that now more than ever needs to be protected. China’s indigenous pig population is a precious genetic resource. Pigs were domesticated from wild boars in southern China as early as 10,000 years ago, and more extensively throughout other parts of the country 6-7,000 years ago. Millennia of animal husbandry produced a genetically diverse range of locally adapted indigenous pig breeds with characteristics such as high prolificacy (large litters) and juicy, flavorful pork. When the Chinese Academy of Agricultural Sciences undertook the first national survey of indigenous livestock in 1960, researchers found more than 100 indigenous pig breeds, which ranged from the extreme northeast of modern day Heilongjiang Province, to the Tibetan Plateau, and all places in between. Today, indigenous pigs are being replaced by exotic breeds. By one expert estimate, more than 90% of all the pork in China – which is half of all the pork in the world – is produced from imported breeds, either as pure lines or hybrids. Indigenous pigs are raised on conservation farms, but rarely produced for use. This presents a grave threat to genetic diversity, which is crucial for disease resistance, and for the future of livestock production. At the same time that indigenous breeds are being replaced, so too are the production systems used for centuries to raise them. Traditionally, virtually all farm household across China raised at least one or two pigs each year. They did so on about a half acre of land, using locally occurring or produced feedstuffs to make pork for holidays and celebrations, and manure to fertilize crops for consumption and/or sale. This production system was neither resource-intensive nor pollution- and carbon-extensive. It didn’t contribute to utopic or materially rich lifestyles, but it did contribute important knowledge and practice about how to produce food in a way that sustains socio-ecosystems. This knowledge is a basis upon which a different kind of ‘modern development’ can proceed, to improve lives and livelihoods in rural China while providing guides for making urban consumption more sustainable. Today, smallholder systems are under constant threat. Large-scale concentrated livestock feeding operations are growing in both number and scale. They rely on commercial feed, much of which is produced from North and South American soybean imports. The breeds in this system have changed, the feeds have changed, the ownership and decision-making processes have changed, and the amount and meaning of manure has changed to become a water pollution crisis. At the same time, the form of the pork has also, and importantly, changed. Pigs fed on kitchen and farm scraps, and on coarse feeds like sweet potato vines and other herbaceous plants, produce a high ratio of fat to lean meat, as their diets are composed primarily of carbohydrates, rather than protein. 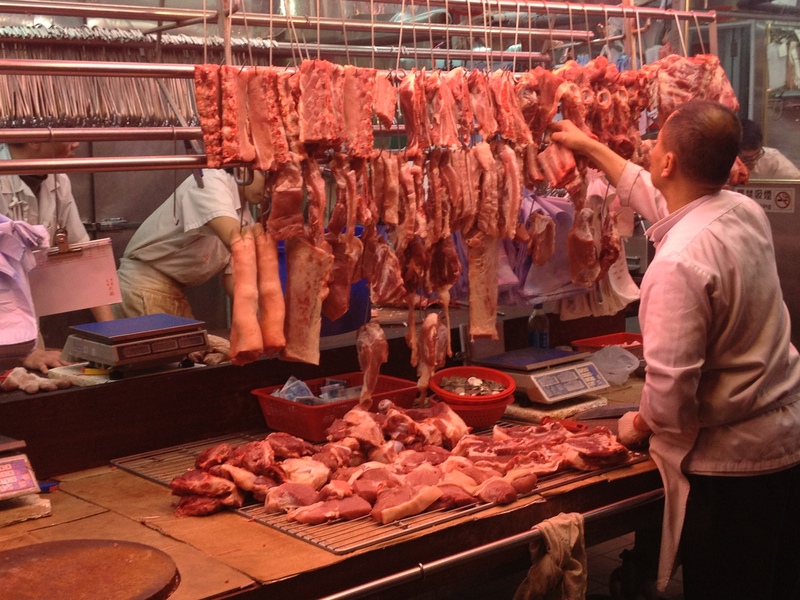 The practices of China’s smallholder farmers, therefore, resulted in a particular kind of pork with thick layers of fat: this is the pork at the heart of Chinese culinary traditions, and the pork that was important to Chinese diets when grains and root crops were the primary source of calories. Most people throughout most of China’s long history, ate pork only once or twice a year during New Year’s celebrations in the spring, and variously at weddings, birthdays, and funerals. The pigs slaughtered at these events also provided lard for cooking long after the fact. Fatty pork was the basis for pork dishes and styles of cooking, and it continues to be the culturally preferred and treasured form. Today, as industrial livestock systems produce leaner pork, people mourn the loss of flavor and texture. As fat is now of the intramuscular variety, rather than the stacked and layered variety, dishes like Chairman Mao’s favorite hongshaorou (soy-braised pork) are difficult to achieve in their familiar form. Fatty pork should be preserved as an important cultural heritage. The context within which people have historically eaten fatty pork in China is, of course, important. During the centuries when the population practiced small-scale, dispersed, local forms of agriculture, meat consumption in general and pork consumption in particular was peripheral in diets. A comprehensive survey from early in the 20th century estimated that before 1949, most farmers (who comprised most of the population) derived only 1% of their food energy from meat. In this agrifood situation, fatty pork made sense as a source of protein and of needed fat. Today, meat consumption in China has skyrocketed. Compared to 1980, Chinese people on the whole eat four times as much meat, or roughly 54 kg of meat per person per year. Pork consumption has doubled in the past 20 years to the current level of almost 40 kg/person/year. This growth in uneven, with urban consumers eating about twice as much as their rural counterparts, with variation between and among income groups as well. Along with this massive growth has come massive public health challenges: obesity, heart disease, diabetes, and a range of diet-related cancers plague the country. Food safety tops the list of public safety concerns, with direct connections to industrial pork production. And the heavily polluted waterways that brim with manure, producing toxic algae blooms, present another public health disaster. These issues are the result of not only so-called modern pork (indeed, diet-related diseases result from a mix of food and nutrition factors, of which meat is one piece), but also of the level of consumption. Preserving fatty pork, and the culinary traditions associated with it, can at the same time promote moderation as part of modernization. Surely, if Chinese consumers were to eat fatty pork at the rate they currently eat leaner industrial pork, this would present further health challenges. However, promoting the tradition of reserving pork for special occasions would solve many problems in China and in the world today: less manure to pollute, fewer greenhouse gasses to change the climate, more production from indigenous pigs, less production using imported feedstuffs, healthier human diets, and better public health. 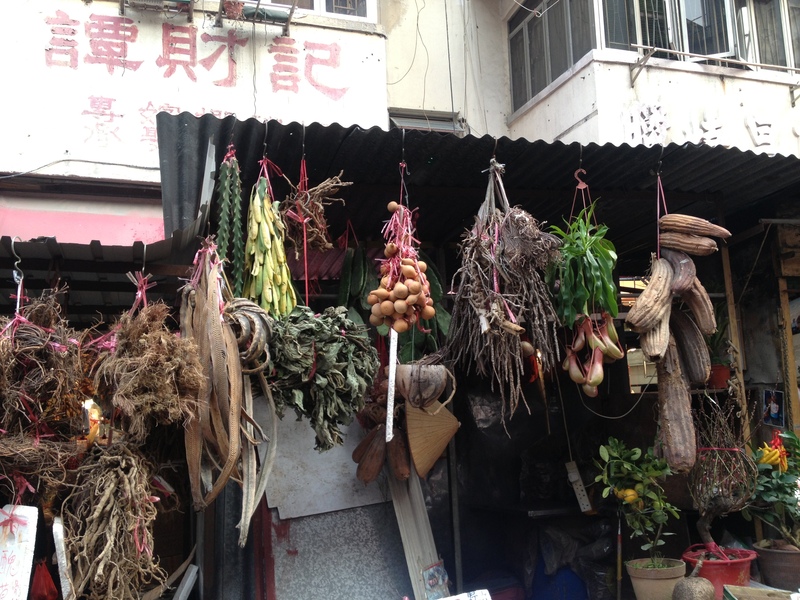 At the same time, Chinese culinary traditions would be preserved, as would Chinese sustainable agricultural traditions. These are things that China needs to protect, and that the world needs desperately to learn from. China’s pigs, pork, and sustainable agricultural practices should be added to UNESCO’s ‘Intangible Cultural Heritage of Humanity’ list. China needs this designation. And the world needs this designation. This week, IATP will release four new reports on agriculture in China, including looks at the dairy, poultry, feed, and pork industries. To accompany the launch of the reports, the Institute is also hosting a series of webinars. The second, on “China’s Meat Revolution: Agribusiness, Growth and Its Limits,” is Wednesday, February 19 at 10am CST. I’ll discuss the historic ascent of pork in China, the role of domestic and transnational firms, and some of the environmental implications. You can register for free at the link above. China is the world’s largest producer and consumer of pork, the second largest producer of poultry and the fourth largest dairy producer. How and why has China achieved this “meat miracle”? What are the politics of this growth and the role of Chinese and foreign transnationals? Can China continue producing and consuming more or are there social and ecological limits that create “peak meat”? 1. Where does Hong Kong’s food come from? 2. What are some of the social and environmental impacts associated with the food and agricultural systems that produce Hong Kong’s food? 3. Are there more sustainable food and agricultural models that can reverse or alleviate these impacts? Wet market in Hong Kong, 2013. Starting from these questions, RTHK researcher Stephen Mak, and producer Joseph Hung contacted me earlier this year to discuss the costs and benefits of agricultural development in China in particular. Sharing concerns for food-related issues and how best to put them in the context of a changing China and a changing world, we began collaborating on ways to frame the topic. Last week Joseph came to Baltimore with a camera man named Kevin to interview me for the project. It was one stop on their North American filming tour that included grain farms and feedlots in Nebraska, the state fair in Kansas, cattle ranch in Colorado, and fishing in Vancouver. I shared perspectives from my research on the global and local implications of increased meat consumption in China, starting with the cultural, political, and agroecological history of small-scale pig farming there, and moving through to the pollution, climate, and equality issues (and crises) that have emerged along with US-style large-scale industrial meat production. In order to move beyond just the problems of the agrifood system, I wanted to introduce the concepts of agroecology and food sovereignty into the conversation. While I could offer only a summary and brief explanation, I was thrilled that we had the opportunity to visit Blain Snipstal at Five Seeds Farm outside of Baltimore for a look at these practices and philosophies in action. 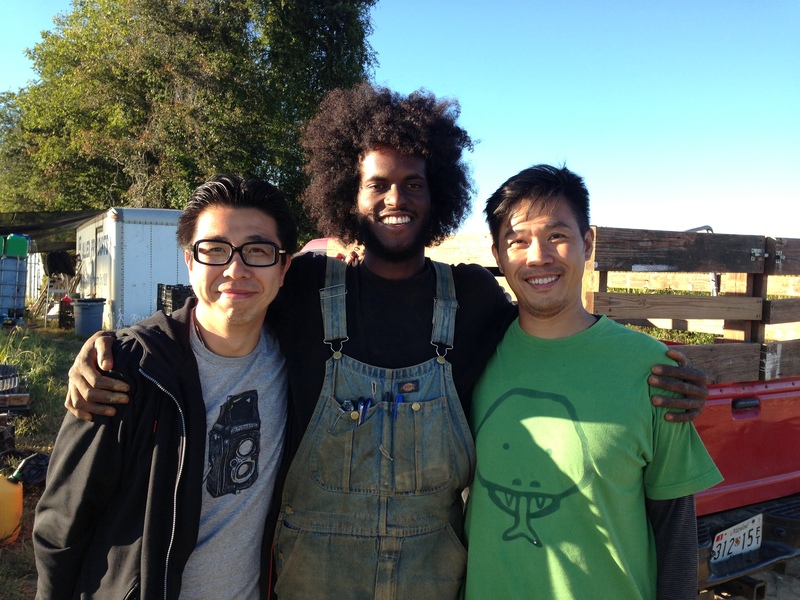 Joseph, Blain, and Kevin at Five Seeds Farm. I met Blain at a food sovereignty conference in New Haven earlier this month. He was on a panel representing La Via Campesina, Rural Coalition USA, and himself as a farmer, or as Joseph came to call him, a farmer-philosopher. 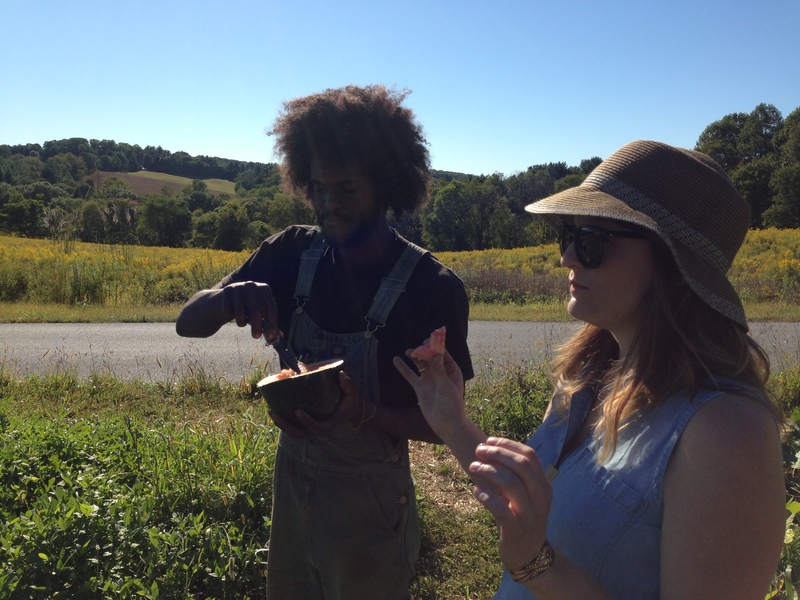 With the farm’s founder, Denzel Mitchell, Blain farms vegetables, fruits, herbs, honey, and eggs on a little more than five acres of land in Sparks, Maryland. Five Seeds has a 50 member CSA, and they sell produce at farmers’ markets and through direct marketing to consumers and restaurants in Baltimore. 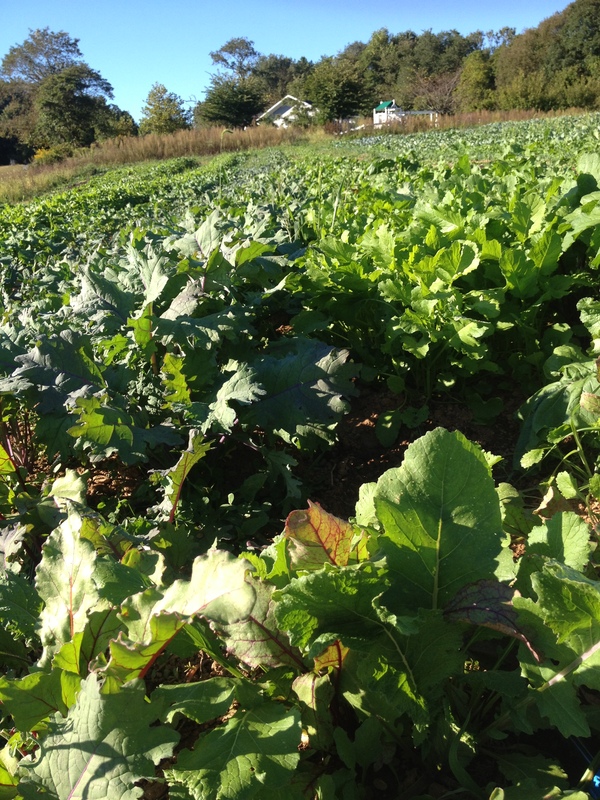 Using cover crops, intercropping, multiplecropping, and high tunnels, Denzel and Blaine are able to produce nearly year-round, providing fresh, non-toxic food for themselves and their community. We believe in increasing soil health, water and soil conservation, biodiversity and living in harmony with the environment. Our cultural practices include (but are not limited to) reduced tillage, raised beds, biodegradable mulches, cover cropping, vermi-composting and reducing off-farm fertility inputs. We straddle the fence in sustainable agriculture but continue to build a healthier and vibrant food system. We remain innovators in a progressive agricultural movement. Five Seeds Farm grows fruit, vegetables, herbs, eggs, honey and animals; we actively choose heritage varieties that threaten to disappear from the collective palate. 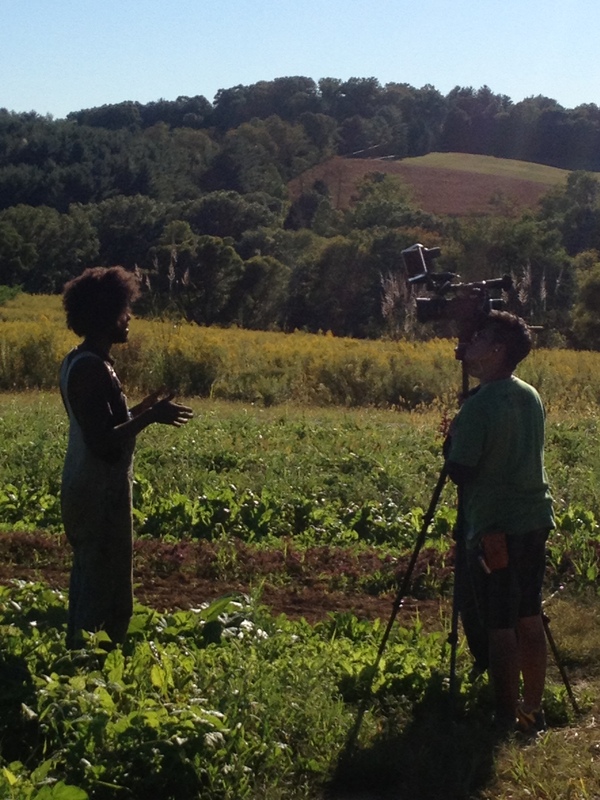 Our focus is to maintain the practice of harmonious diversified agriculture, the cultural and historic legacies of Baltimore’s food history and culture, Black farming and homesteading. Because of Stephen, Joseph, and Kevin’s hard work and vision, and Blain’s commitment to a kind of farming that leaves his fields fit for children to play in and people to eat from, viewers in Hong Kong are in for quite a treat. They’ll see not only the industrial forms of agricultural production that bring much of their food to the island, but they will also see what smallholder farmers around the world are doing to ensure local food security, global food sovereignty, and a food-just future for us all. 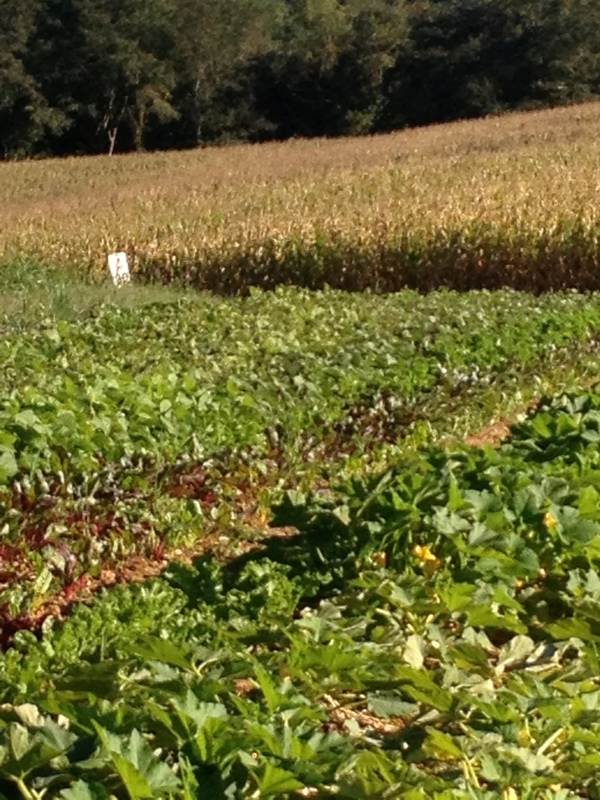 How many crops can you find? 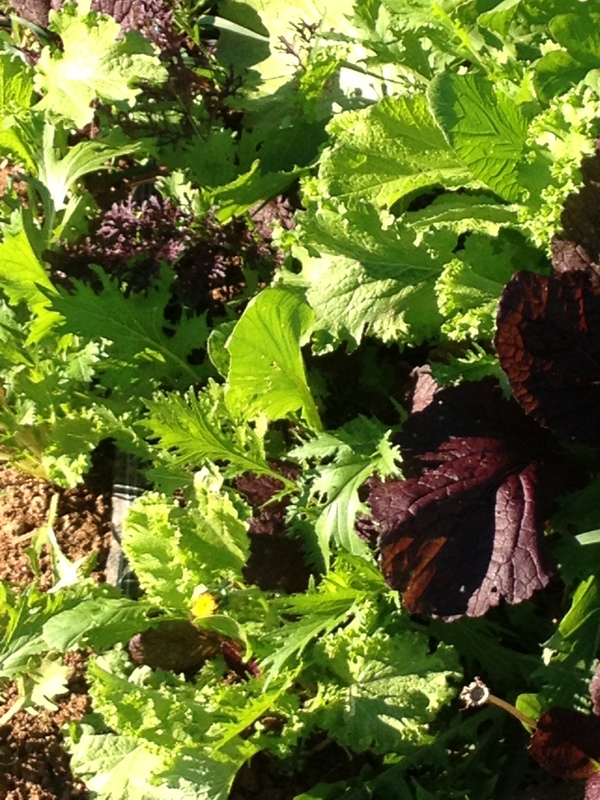 Five Seeds Farm: An oasis of food in a landscape of feed. 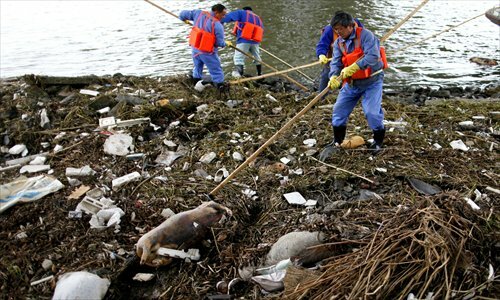 Workers are pulling thousands of dead pigs out of the Huangpu River that runs through Shanghai. Eartags on the deceased swine indicate that they are from neighboring Zhejiang Province, though the cause of death is not yet known. Is this a China problem? Or is this a problem of industrial pig farming? In the cramped and stifling quarters of a CAFO (confined animal feeding operation), genetically identical pigs die because they’re sick and/or stressed, and because the genetic diversity that would otherwise confer some level of disease resistance on the population has been replaced by homogeneity in search of so-called production efficiencies. Dead pigs are common to all industrial production, all across the globe. 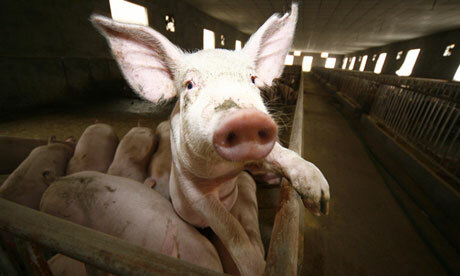 Consider that in the United States, industrial swine farms have an average 3% mortality rate. That means that for a 10,000 head finishing operation, each year, 300 dead pigs have to be disposed of. And that’s just one farm, in a regular season, without a disease outbreak! Disposal practices in the US include burying carcasses on-farm, incinerating them, taking them to rendering plants (of which there are only a few that accept dead animals), or composting them. Composting is the so-called “sustainable” solution to industrial hog mortality. After all, composting creates a nutrient-rich product that can be incorporated into soils surrounding the pig farm, feeding the next corn crop. Except that “nutrients” coming out of the CAFO in the form of manure are already in excess of what the soils surrounding the pig farm can absorb. Industrial pig farming transforms manure from a resource to a waste management nightmare to a serious pollution problem to dead zones to…you get the picture. There’s simply too much. Too much phosphorus, too much nitrogen, TOO MUCH. The dead pigs in the Huangpu likely succumbed to a viral outbreak, which because industrial pig farming is practiced using “improved” pig breeds that are genetically identical (and by the way, are the very same pigs we produce in the United States), easily wipes out hundreds or thousands of animals in one go. This incident is not the result of production mismanagement by Chinese farmers, although this is the analysis we’ll no doubt see in the Western press (and dumping infected swine carcasses in rivers is surely its own special form of mismanagement, but that’s a different issue). We’ll also see the industry in the US come out and say that we don’t have dead pigs in our rivers, and we’ve got this dead pig disposal thing nailed down. But they’ll be wrong about that, and both will miss the point. INDUSTRIAL PIG FARMING IS THE PROBLEM, NOT JUST CHINA’S VERSION OF IT. China’s taste for pork serves up a pollution problem. Economistic thinking is the default setting for understanding how the world works. Perhaps nothing illustrates this more than the theory of supply and demand. From hedge fund managers, to professors of economics and business and psychology and plant breeding, to policy makers and analysts, to students, to journalists, to grandma, to your average Joe(lene), when confronted with issues of resource distribution, supply and demand is the go-to explanation. The idea that markets simply respond to “what people want,” pricing those things based on “what is available,” might in fact be the most powerful idea shaping our world today. I’ll be quite forward: I don’t believe in supply and demand. I don’t think it’s a real thing, and I don’t think it’s even a good idea for organizing the allocation of resources. In relation to the hegemony of supply and demand thinking, one of the most difficult problems to arise is that we tend to mistake something that is a concept and a construct, for something that is natural, inevitable, and just “the way things are.” We reify it. Pig Progress news from today provides a concrete example of this process: the article US: Funding to drive pork demand is a peek into the way that millions of dollars are expended to create consumer demand, and at the same time, to funnel capital to agribusiness. Demand, in other words, is a construct, with powerful forces behind every turn. I imagine that one of the reasons we’re so keen on the idea of demand is that it makes us, as individuals, feel we have something to contribute – some power – in shaping the course of economies and societies and histories. But thinking of our engagement primarily in terms of what we do with our wallets is outrageously disempowering, and suggests more about the ways in which we’ve actually been disempowered in the course of the attempted marketization of everything. What we buy is not who we are. We are not empowered through consumption. I demand a food system that isn’t controlled by corporate elites who use “food, agriculture, land” as investment categories; a food system that doesn’t make our air, water, and soil toxic; a food system that operates in a way that gives people dignity and nutrition and community; a food system that is inclusive and equal. These demands have no price or market. We can’t buy them; we can only make them.